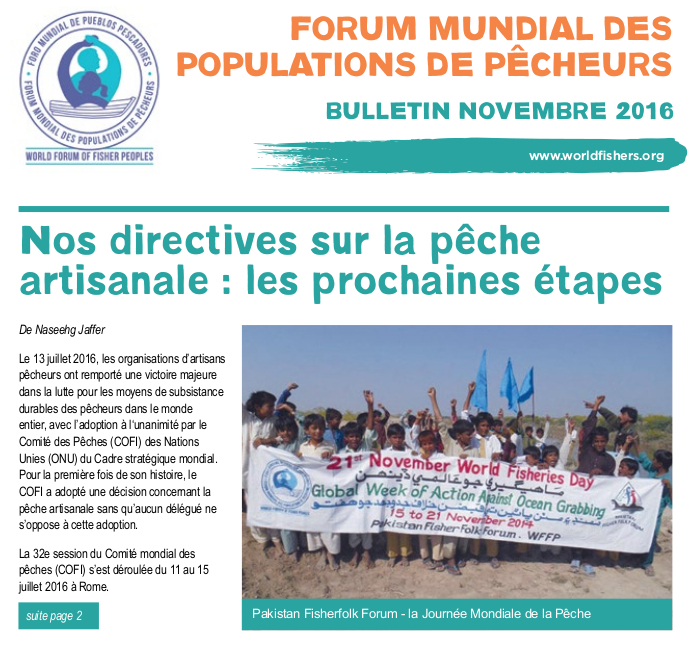 Joint statement made by: WFFP, WFF, CSF, PC on Agenda Item 10: Good Practices in the Governance of Small-Scale Fisheries: Sharing of Experiences and Lessons Learned in Responsible Fisheries for Social and Economic Development. Made at: The 29th Session of the Committee on Fisheries (COFI), 3 February 2011. 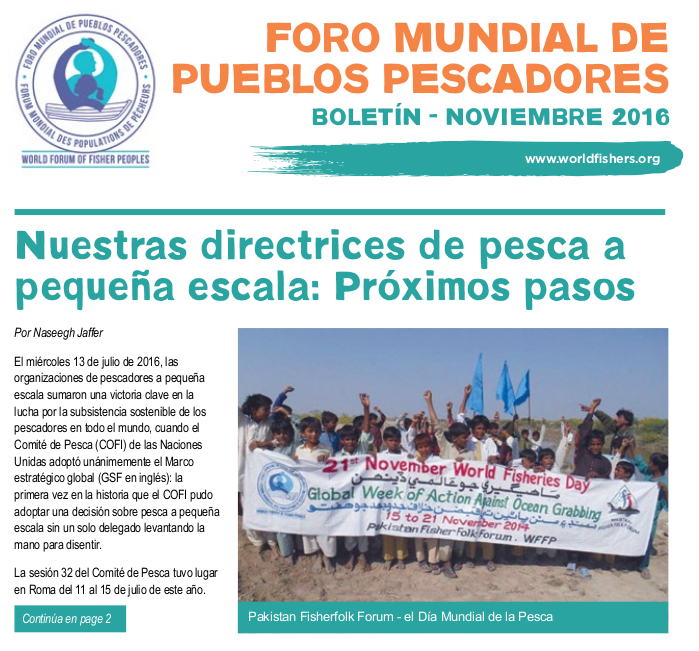 I read this statement on behalf of the World Forum of Fisher Peoples (WFFP), the World Forum of Fish Harvesters and Fishworkers (WFF), the International Collective in Support of Fishworkers (ICSF), and the International Planning Committee on Food Sovereignty (IPC). I am the President of the Chilean artisanal fishworker organization, CONAPACH. I come from a fishing family from the South of Chile, and our livelihood depends entirely on fishing. Our communities make important contributions to economic and social development, nutritional security, and societal and cultural values. However, we face many kinds of problems. We do not have secure rights to our lands and fishing grounds. Our resources are often threatened by industrial fisheries and aquaculture, and by polllution. We work under difficult and unsafe conditions, with no social safety nets. We lack access to even basic services such as health and education. Women in our communities experience very specific forms of discrimination. We had requested the last COFI to include a specific chapter on small-scale fisheries in the Code of Conduct for Responsible Fisheries (CCRF). It gave us hope when you agreed to explore the option of an international instrument on small-scale fisheries and a global programme of assistance. We know that much information is contained in a variety of documents, voluminous and short, that deal with the issues of small scale fisheries. But this information, because it is both abundant and dispersed, is of no use. We feel that this justifies reviewing it and incorporating it in summary form into the instrument that has been proposed by 22 Members of COFI. 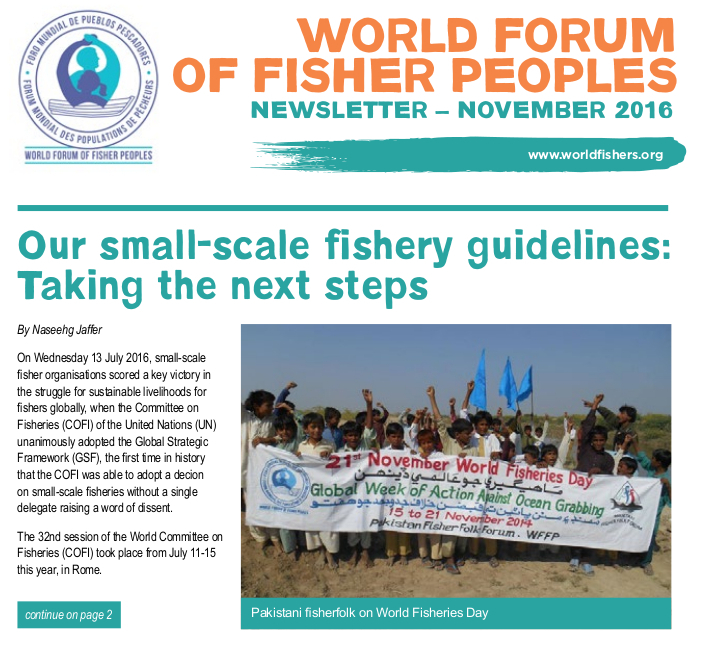 We call on you to take decisive action now to support small-scale fisheries. We urge you to decide on a negotiated international instrument on small-scale fisheries to complement the Code. For us this will have great relevance as it will provide guidance to regional and national plans of action, and to national legislation and policy. Such an instrument, we feel, should be global in scope and should build on the principles identified during the regional workshops organized by FAO in October 2010. It should recognize the social, economic, cultural, civil and political rights of small-scale, artisanal and indigenous fishing communities. We also call on COFI to support a global programme of assistance on small-scale fisheries, developed and implemented in consultation with us. Such actions will go a long way in ensuring a better and more dignified future for our communities. We hope that COFI takes a positive decision to support us. Should that happen, we undertake to collaborate with all of you to take this process forward. It is our fervent hope that you will take decisive action on this before we are left with neither fish nor artisanal fishworkers.